Square des Batignolles, covering 16,615 square meters of land, 4 acres, 1.66 hectares, is the largest green space in the 17th arrondissement. The origin of the name "Batignolles" could have been derived from the latin word "batillus" meaning "mill". Or, it could have come from the provencial word "bastidiole" meaning "small farmhouse". Until the early 19th century, the area was deserted countryside with a few scattered farms. In 1860, Napoleon III and Baron Haussmann annexed the district into Paris city limits. 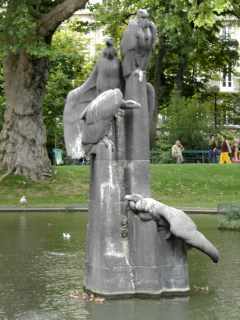 In 1862, Jean Charles Adolphe Alphand designed and created the Square des Batignolles. 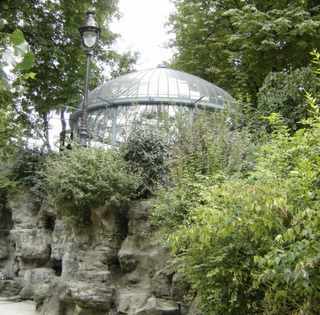 Alphand was the engineer for most of the parks built at this time including Parc des Buttes Chaumont, Parc Montsouris and others. It is designed in the naturalistic English garden style and it is lovely. 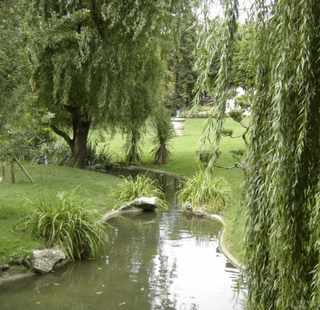 It features a large pond which is fed by a stream that runs through the park. The pond is home to large red Japanese carp known as koi and over 300 ducks. 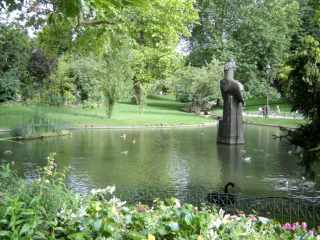 In the middle of the pond stands a statue created by Louis de Monard in 1930 called "Vautours" or "Vultures". 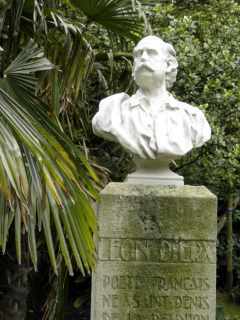 Elsewhere in the Square is a bust of the poet Leon Dierx (1838-1912) created by Bony de Lavergne in 1932. For a park of this size there are surprisingly large, undulating lawns here. 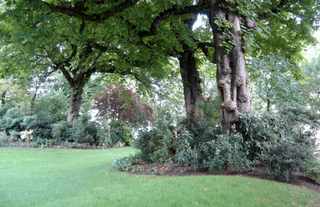 The many wandering walkways are bordered and shaded by a variety of beautiful trees. 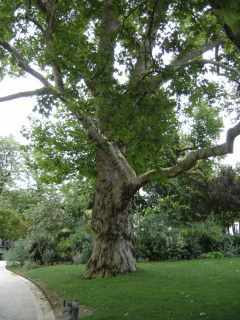 There are Oriental Plane trees over 140 years old and over 30 meters tall in the park. There is a Giant Sequoia, which has yet to become giantesque. There are hazelnut trees from Byzance, Siberian elms, Japanese cherry trees, ash trees, willows, black walnuts and more. On top of a small rocky butte is a glass-walled gazebo acting as a green-house for a solitary tropical palm tree. Square des Batignolles is a terrific park for children. There are several playgrounds, sand-boxes, swings, a carousel with old-fashioned wooden horses, an area for roller skating and ping-pong tables. There are also areas for playing pétanque, or boules, for adults. And, of course, there is a snack-stand in the park.